A group of veterans protested against Gov. Bruce Rauner's proposed cuts to home care services in the state budget. 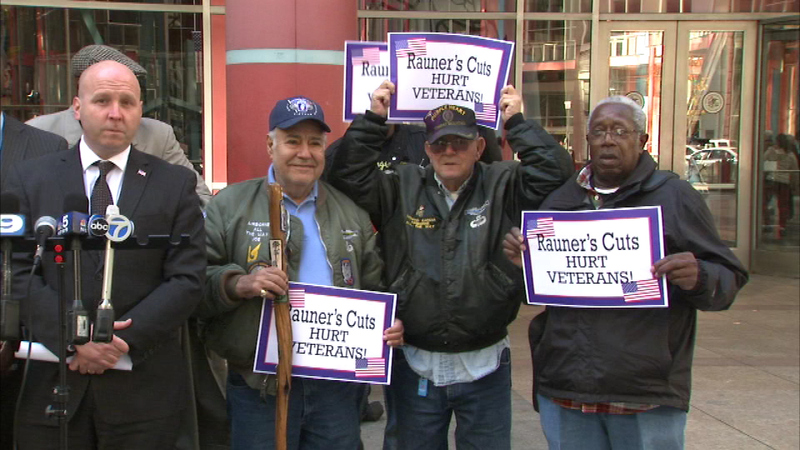 CHICAGO (WLS) -- A group of veterans protested against Gov. Bruce Rauner's proposed cuts to home care services in the state budget. Protesters gathered Monday outside the Thompson Center. On Friday, Rauner used his amendatory veto to change legislation aimed at blocking cuts to the home care bill. The bill now goes back to lawmakers. Protesters say cuts would affect thousands of veterans and people with disabilities. "The affect we have on the disabled and the seniors should not be a matter of how we save money, it should be a matter of how we take care of our most vulnerable," said State Sen. Thomas Cullerton. The home care bill is expected to come up as Illinois lawmakers return to Springfield Tuesday to work on the state budget deadlock.